I finally got the photo situation resolved. 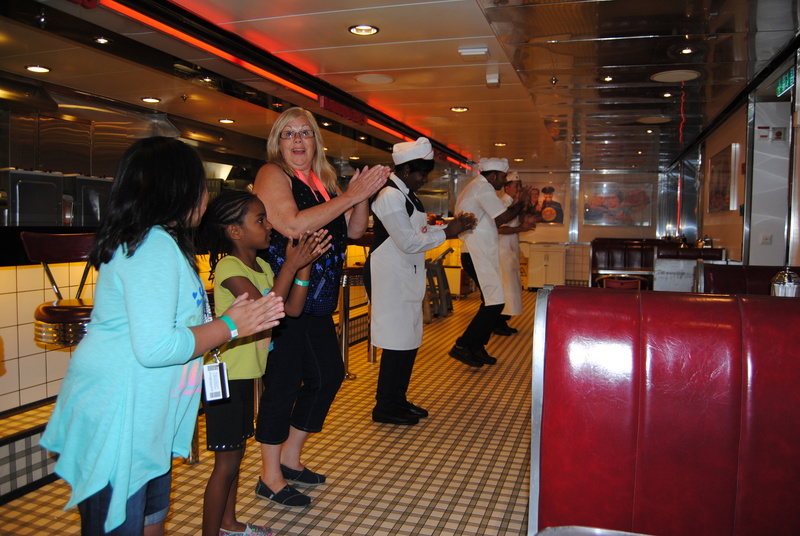 Here are more pictures from our cruise. 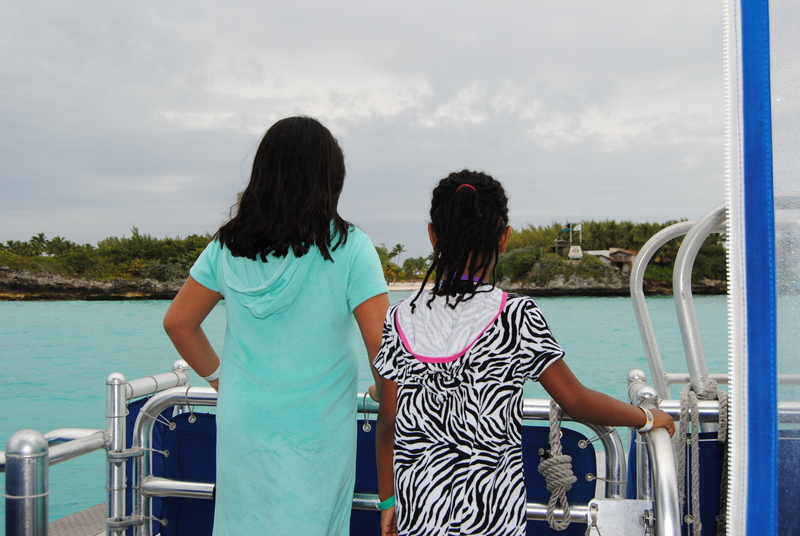 Approaching our Dolphin Encounter excursion at Blue Lagoon in the Bahamas. This is Cacique. 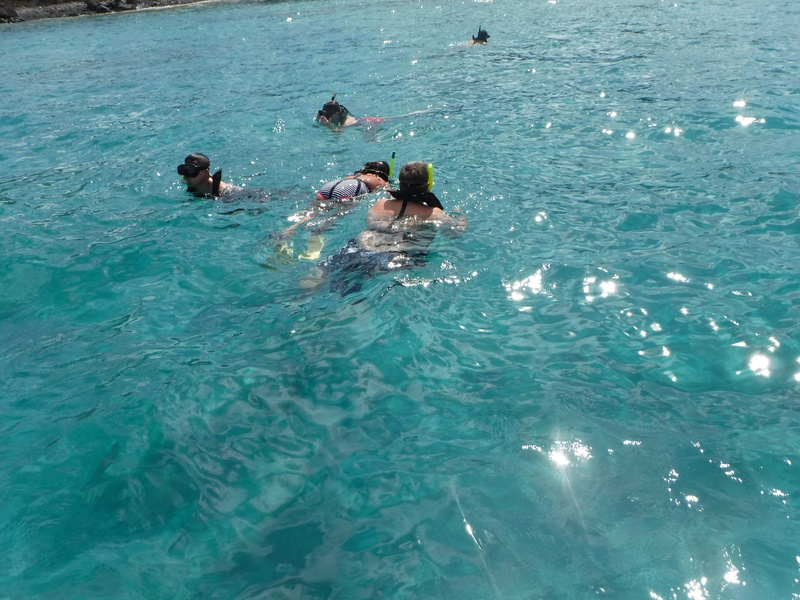 We were able to get in the water with him. It was an awesome experience. 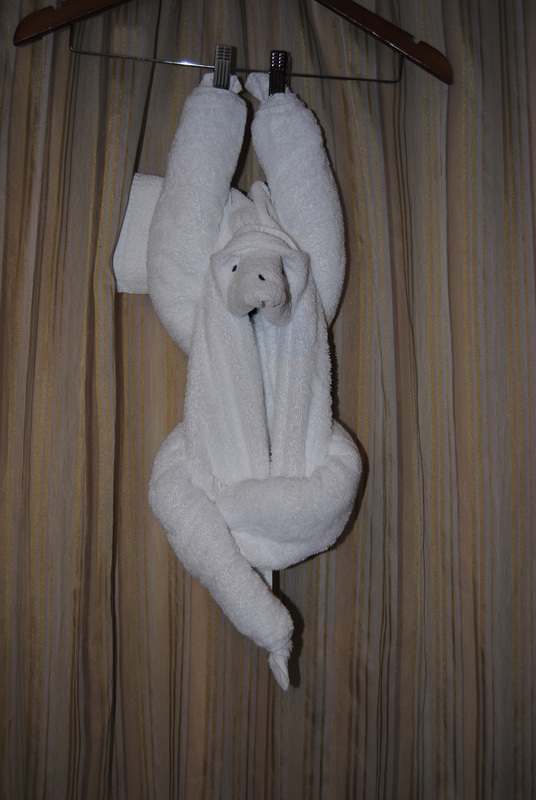 I love the towel origami our state-room attendant left for us. 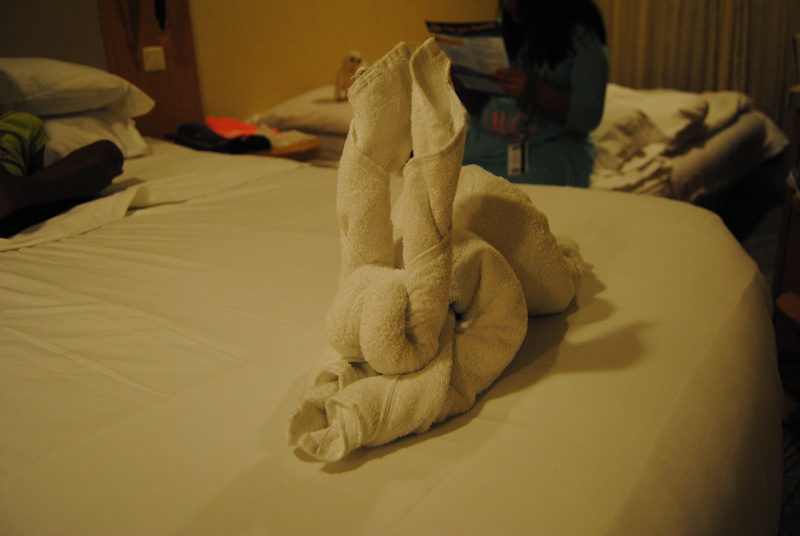 Okay, I am a bit obsessed with the towel origami. Naomi really wanted to get her picture taken next to this car. It was parked on the ship. 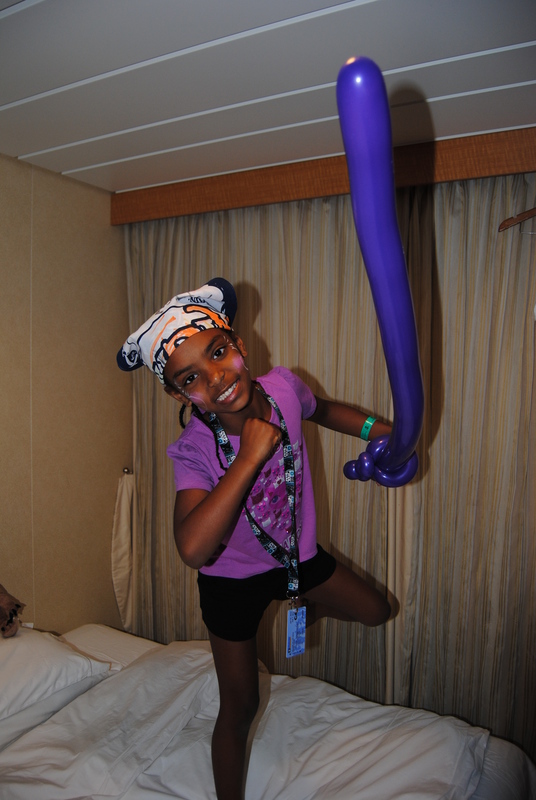 Royal Caribbean has a program for the kids called Adventure Ocean. The girls loved it and one day they decorated bandanas and did a Pirate Parade. Naomi was in character. Hubby forgot about the time difference and his alarm ended up going off much earlier than we needed to rise. 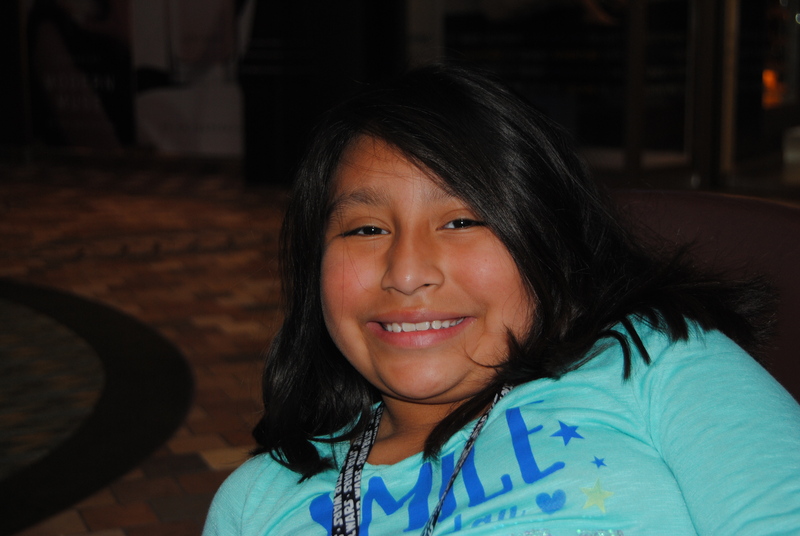 Even though we were all tired, Lili was happy to give me smiles. 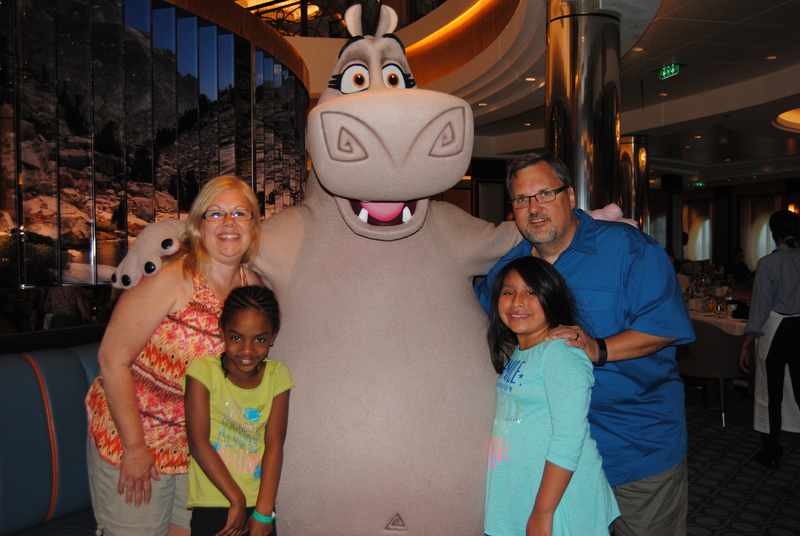 Some of the cruises on Royal Caribbean have DreamWorks characters. So we did a character breakfast one morning. This was on the wall in the dining room. 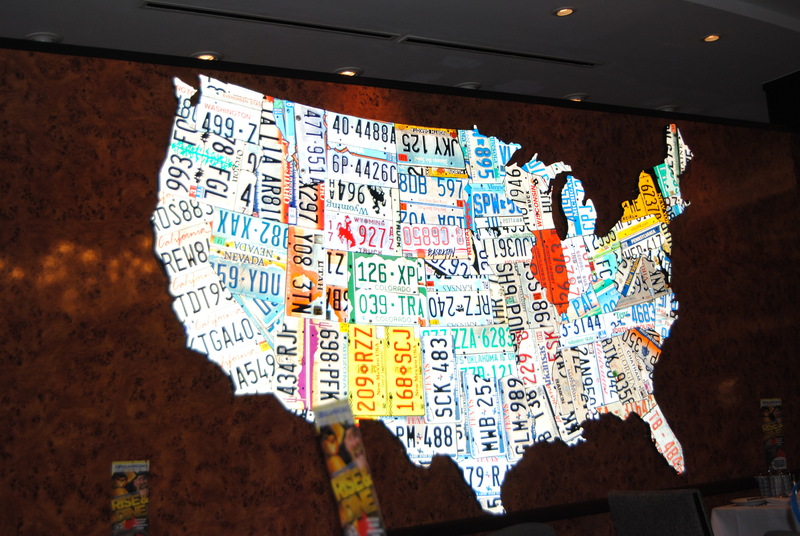 Each state is made from license plates in that state. 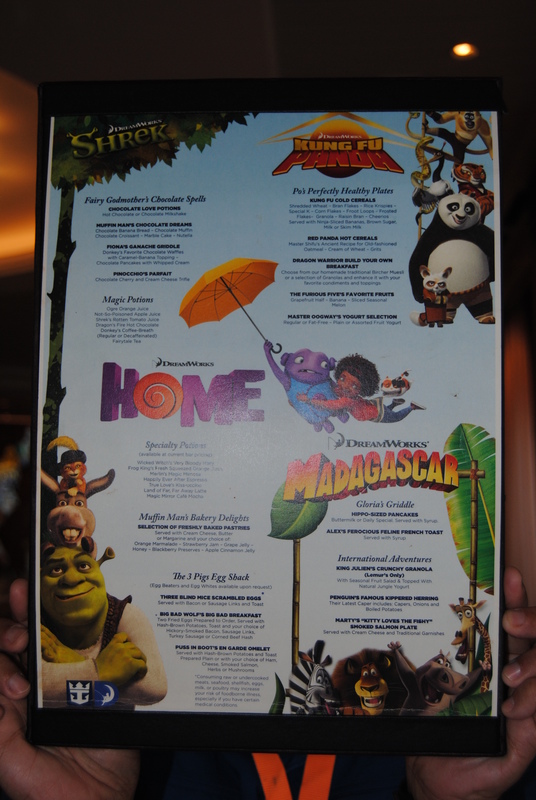 The menu from our character breakfast. Gloria joined the World of Weeks for a photo-op. And Alex joined us for a photo-op. 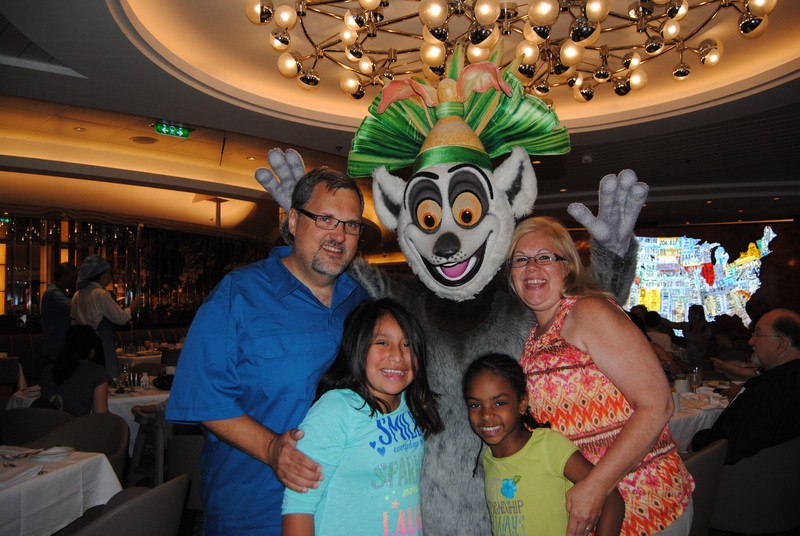 King Julian needed to get in on the action. 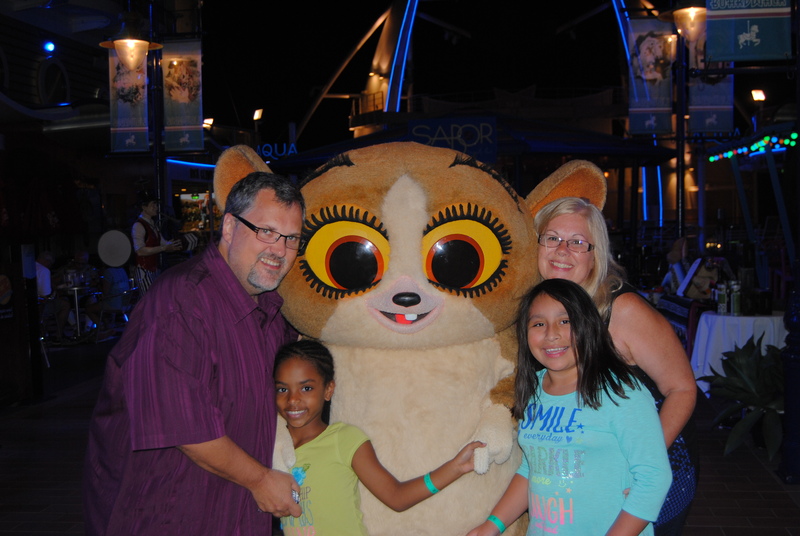 Later that day we caught up with Mort on the Boardwalk. What’s better than a root beer float? 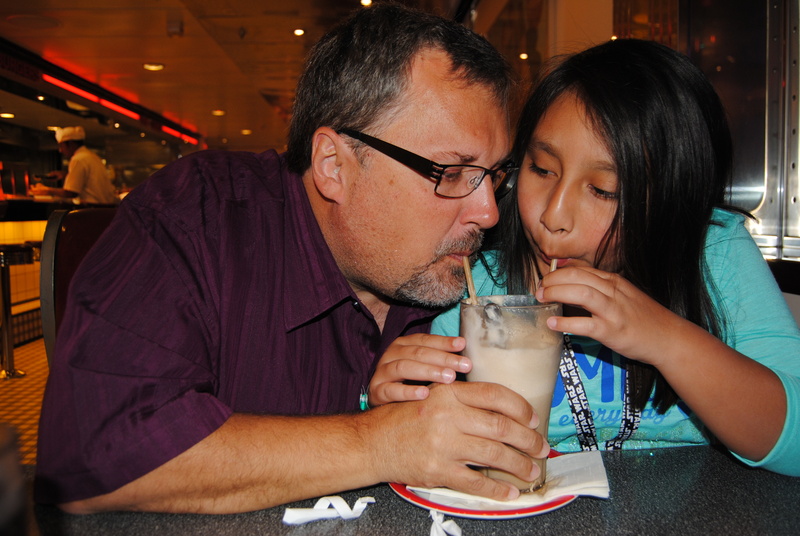 Sharing a root beer float. 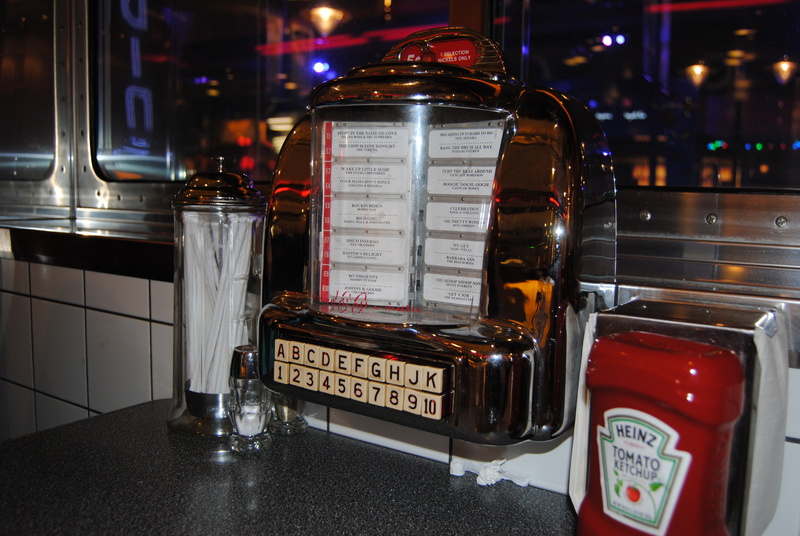 Then getting up to dance with some of the crew at Johnny Rockets. 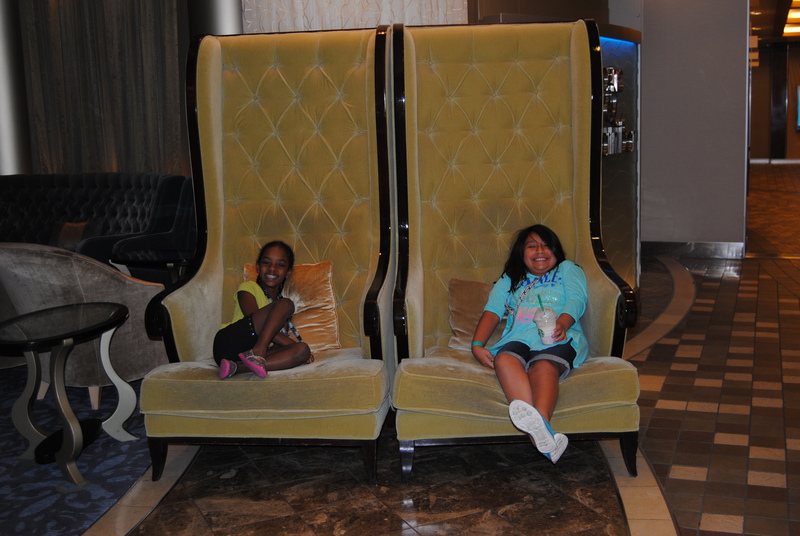 My beautiful girls in Central Park on Allure of the Seas. 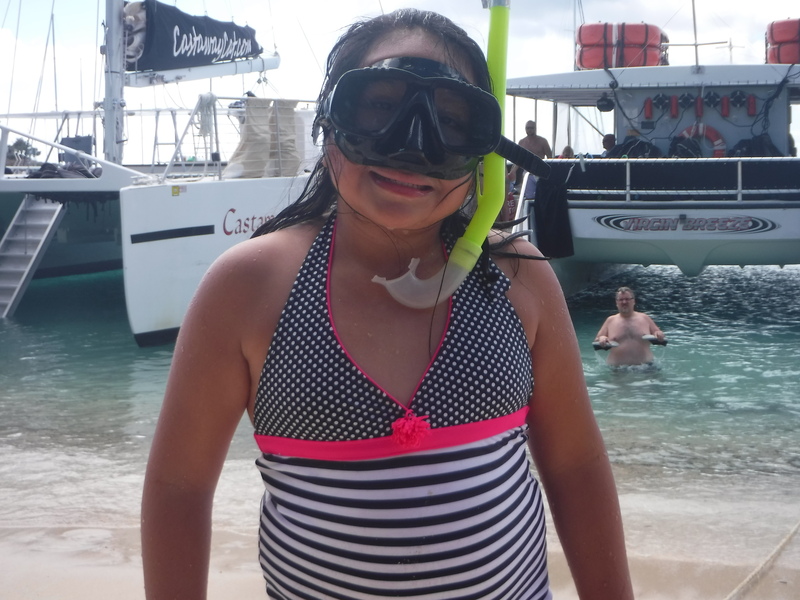 Once Lili got the hang of it, she was all about snorkeling. 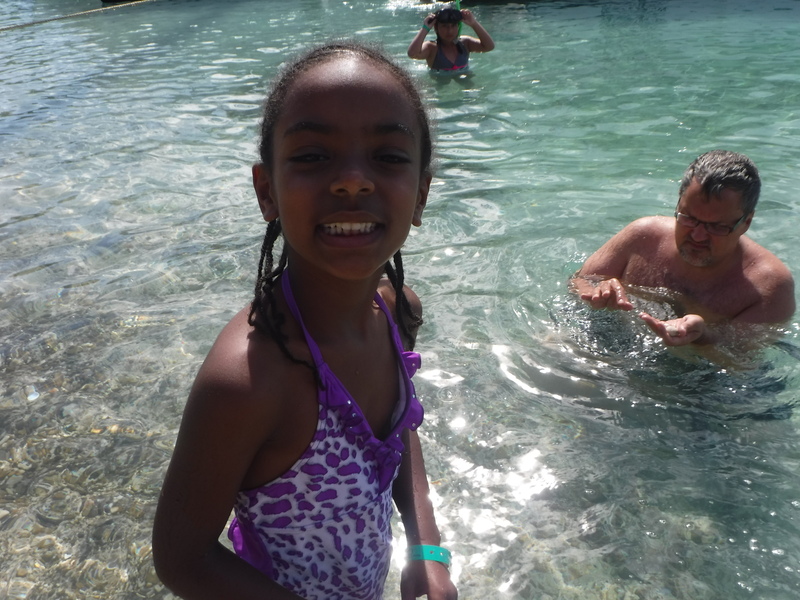 Naomi was all about looking for shells. 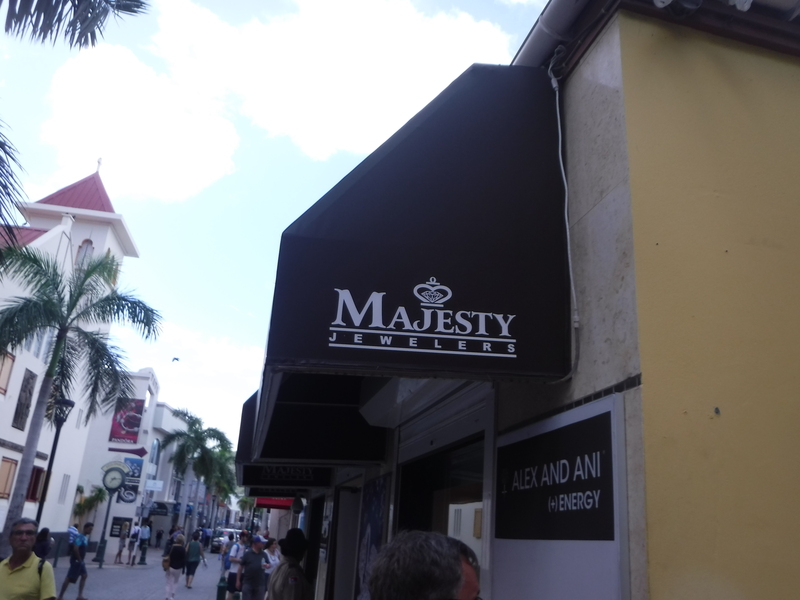 Our last stop before heading back to the U.S.
Hubby and I bought new wedding rings. 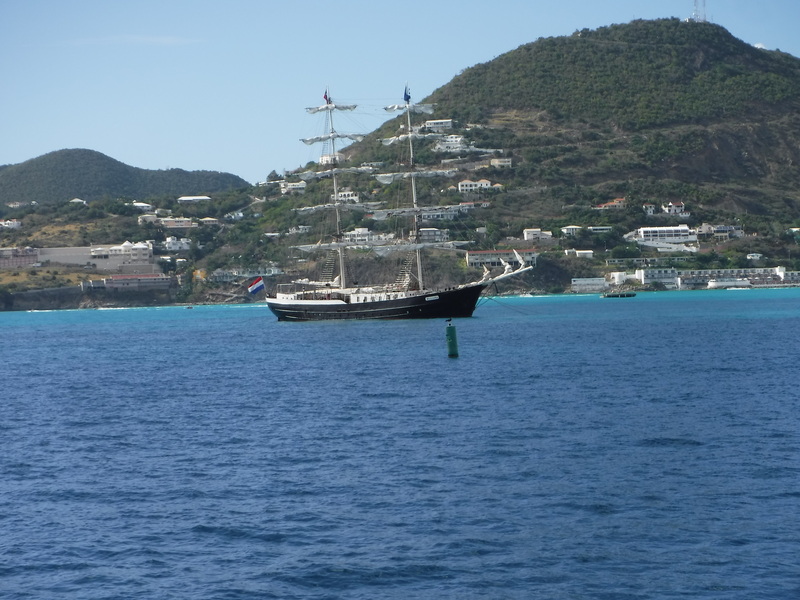 After all, this was a 30-yr anniversary cruise, so why not get new wedding rings. 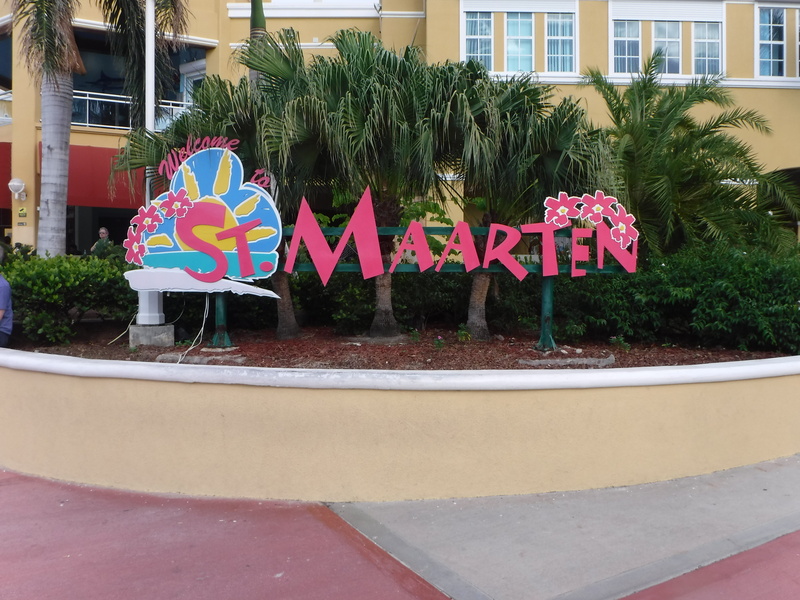 Even with the clouds, St. Maarten was beautiful. 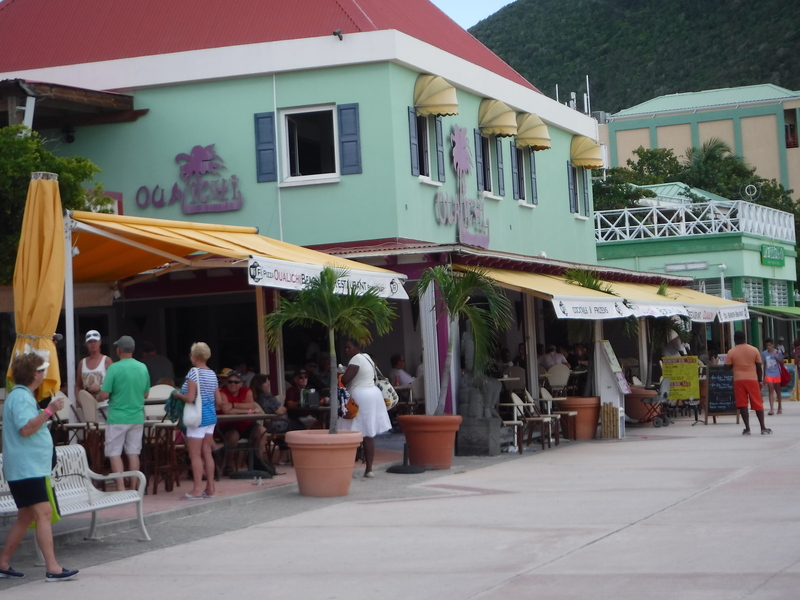 Our St. Maarten lunch spot. 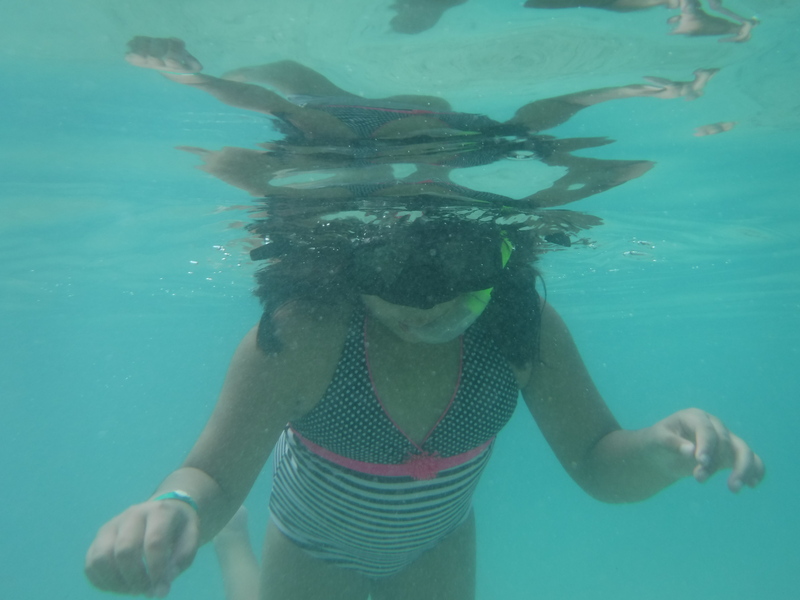 The girls stayed on board enjoying time in Adventure Ocean while hubby and I spent our day together. 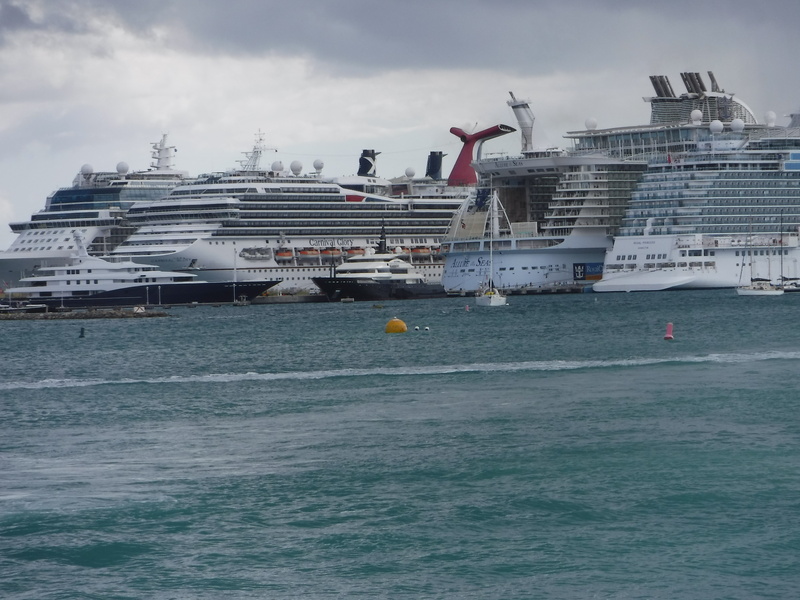 Look at all those ships! 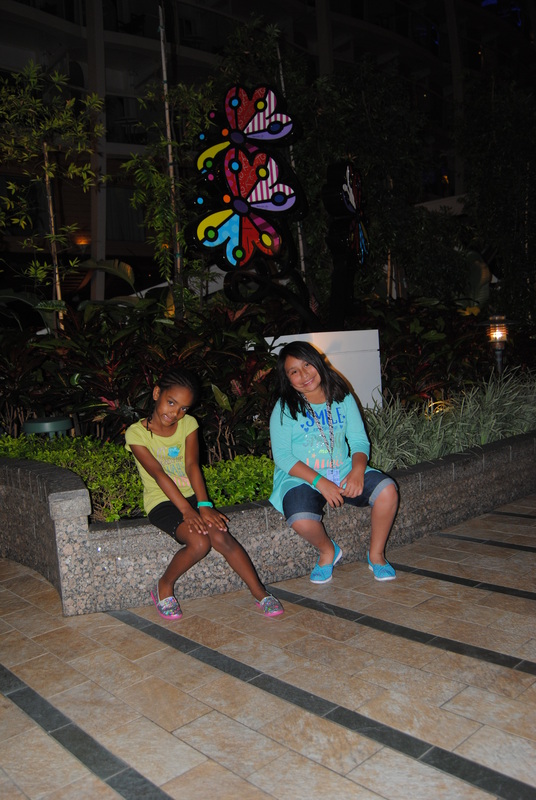 We were on Allure of the Seas. She was the largest of them all. 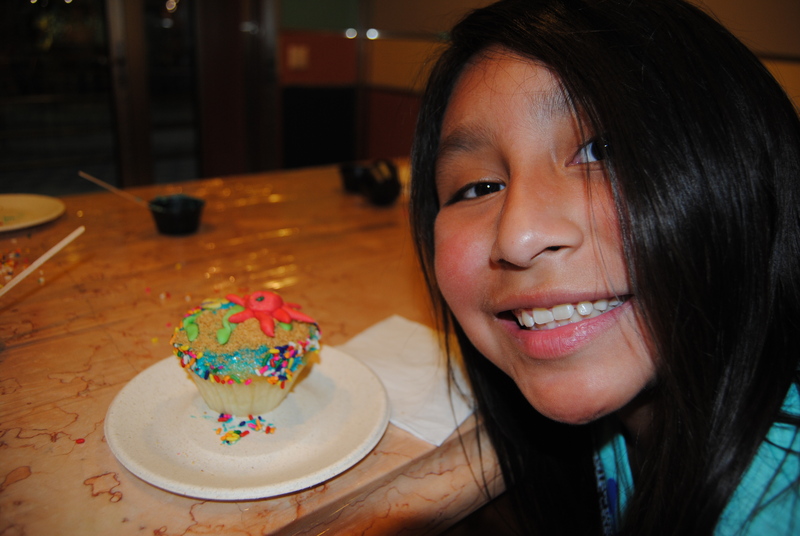 Lili and her cupcake creation. 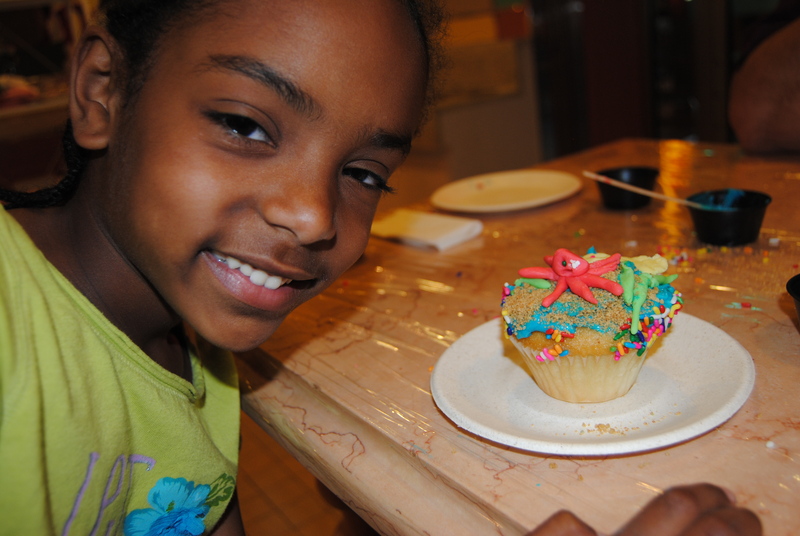 Naomi and her cupcake creation. 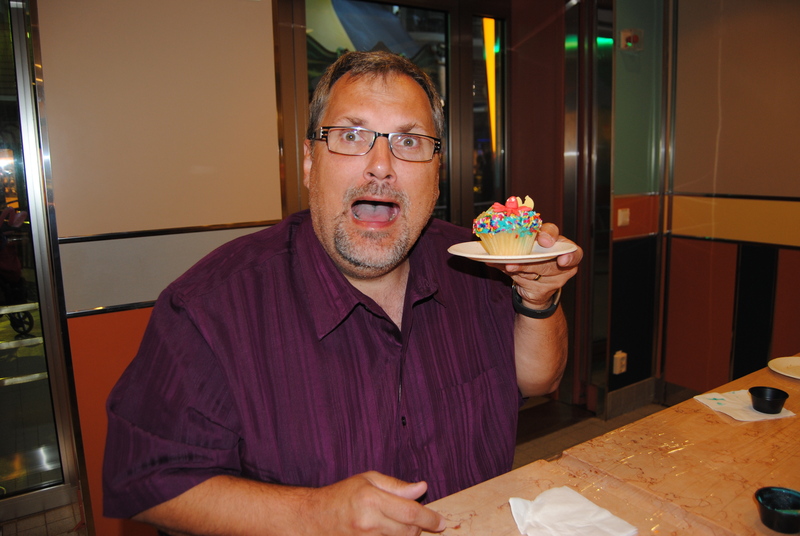 Hubby was imitating the way his octopus looked on his cupcake. 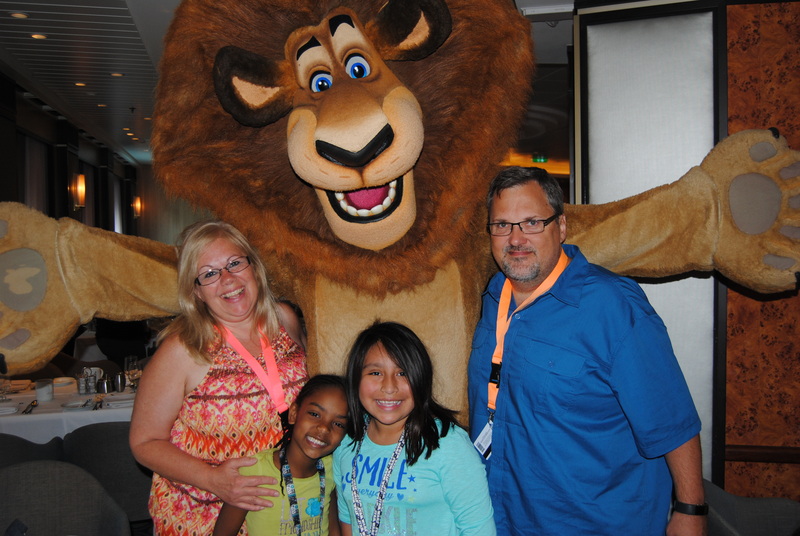 These are just a few highlights from our cruise. Hope you enjoyed them. Wow! Looks like an amazing time! We see cruise ships leave Seattle to head to Alaska for about 9 months out of the year, but I swear those ships are smaller than the one you took. That thing is INSANE! Was it relaxing or just a really busy time? 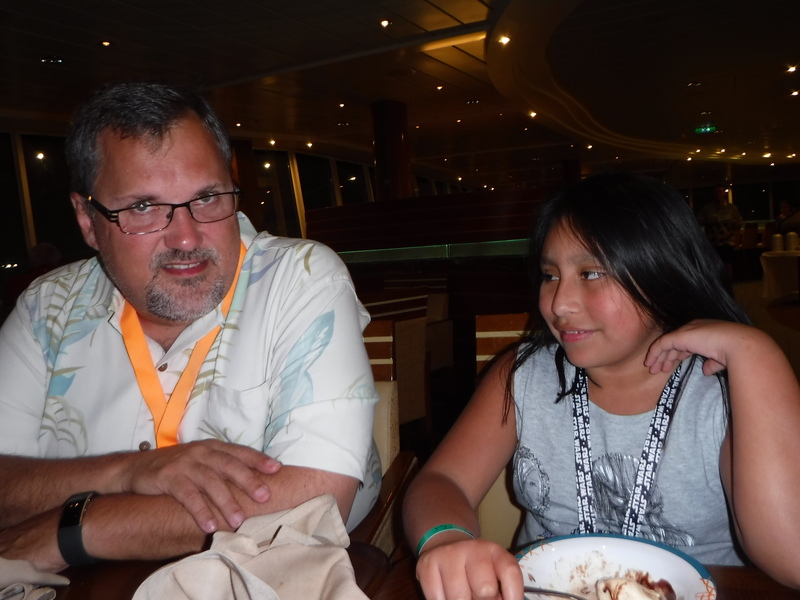 The cruise was so very relaxing. The most relaxing vacation ever!! Looks like an amazing time. 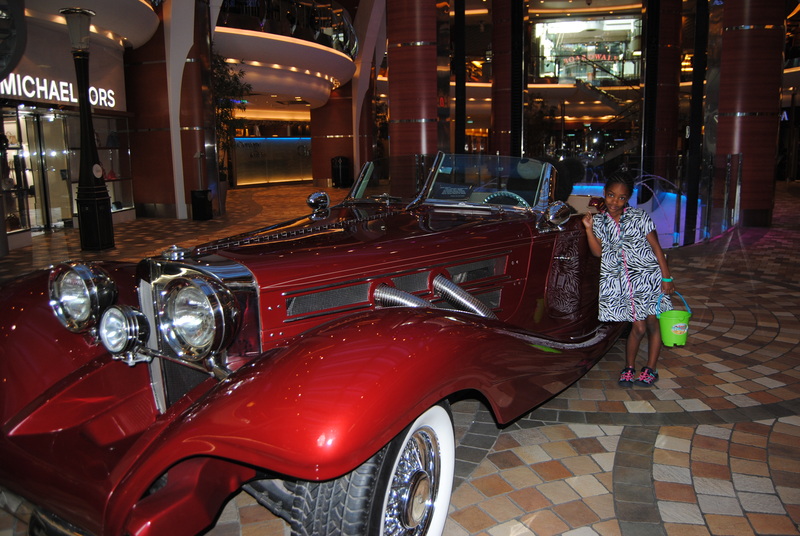 Nothing like a cruise to have great family time and escape from the daily routine. I would most definitely recommend Royal Caribbean. 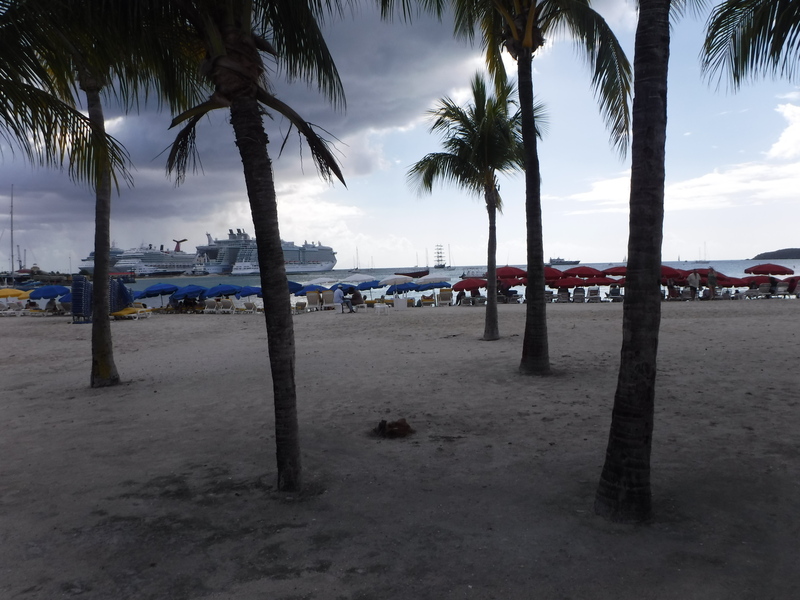 They currently have two of their Oasis class ships sailing out of Fort Lauderdale. 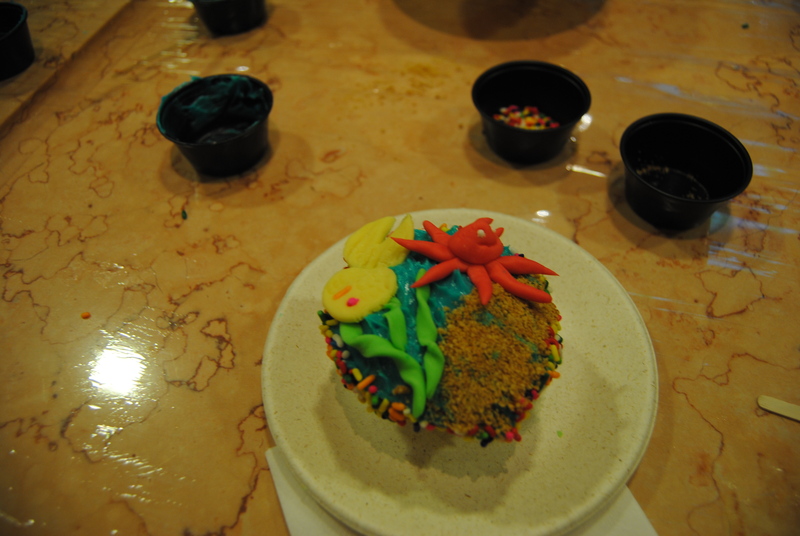 We were on Allure of the Seas. 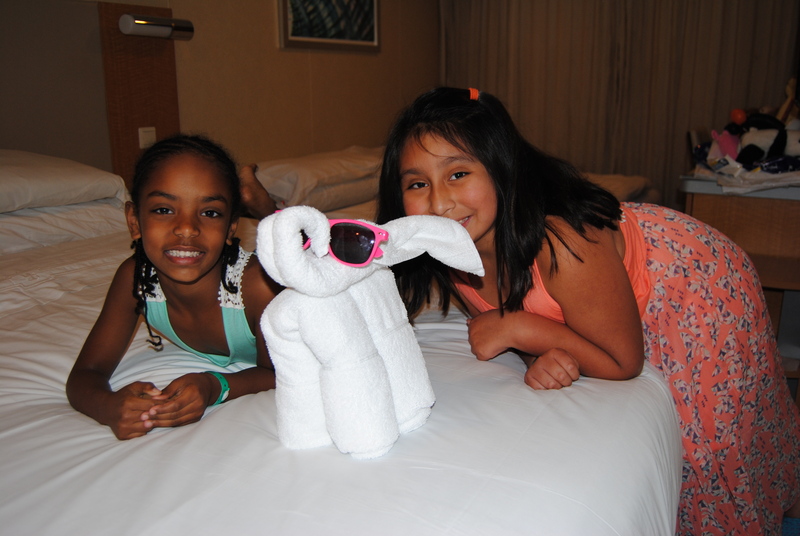 The girls LOVED Royal Caribbean and their Adventure Ocean program (which is part of all their cruise ships). 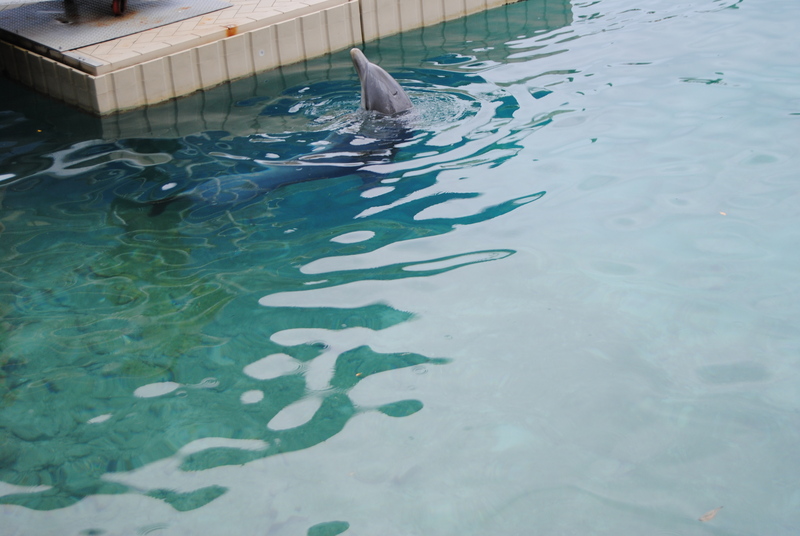 They wanted to be at Adventure Ocean as much or more than they wanted to be with us. We’re going on our next Royal Caribbean cruise next February out of Galveston. 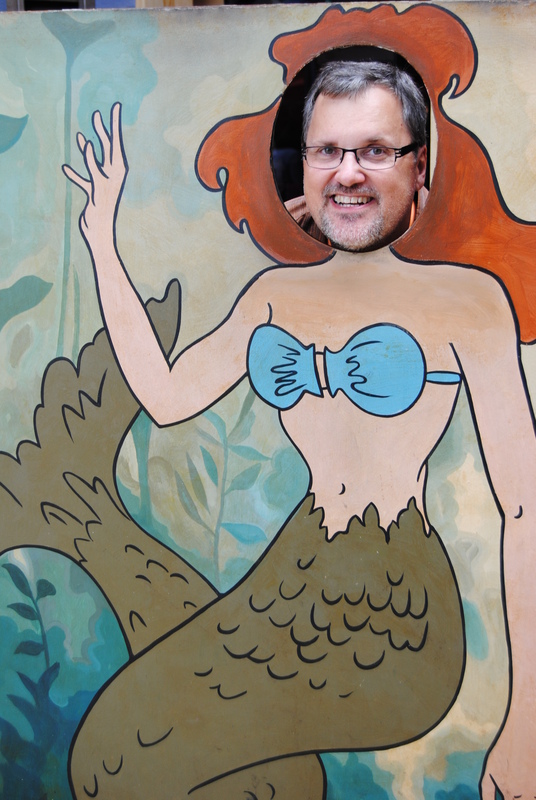 We’ll be on Liberty of the Sea. 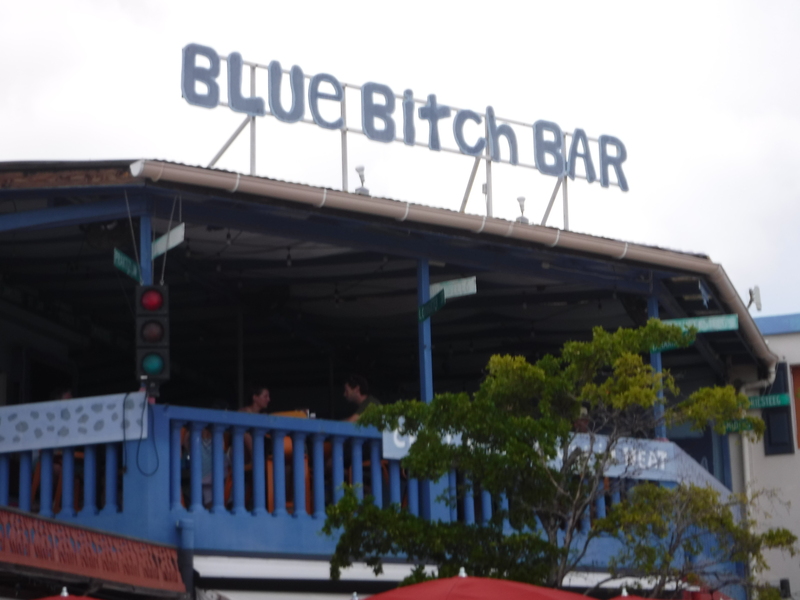 It’s the next class down from Oasis. 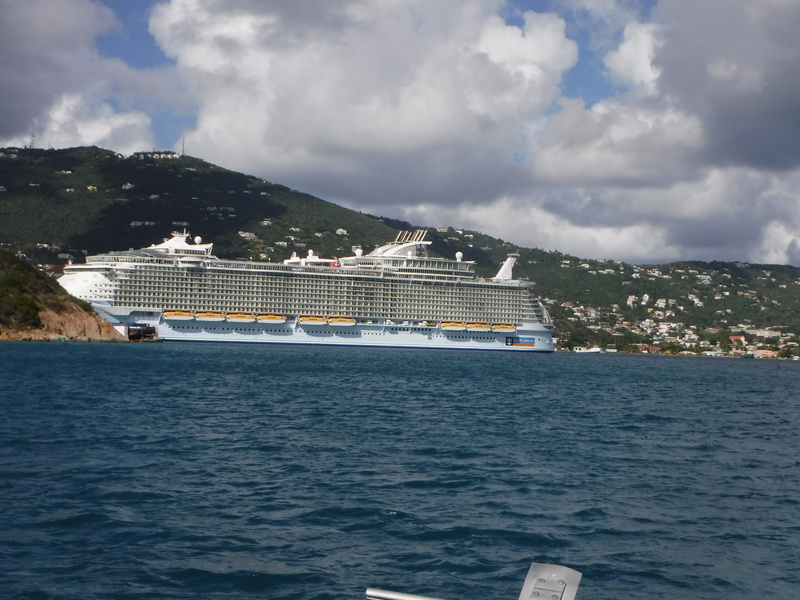 Still a very large ship and Royal Caribbean recently made a lot of upgrades including water slides. It will also be a Dream Works cruise, so we’ll get to see all the Dream Works characters again!!!! Let me know which cruise you decide to take.